You can have light anywhere you need it with Techbee Stick-On Lights. They illuminate cupboards, closets, shelvings and other everyday spaces with ultra-bright, energy efficient LEDs that turn on with a simple tap. 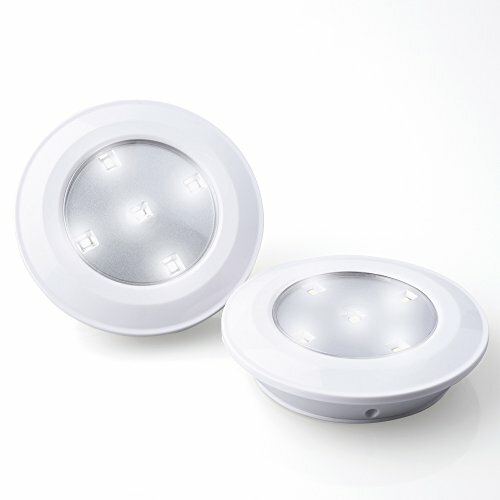 Each unit contains 5 Floodlight LEDs giving you a bright light with an ultra-wide coverage. Without needing any wires, these highly versatile lights are easy to install on any flat surface with the included adhesive tape. Your old stick-on light kept falling off, then broken? The mounting tape included offers a stronger bond than other ordinary adhesive tape. You can also use 2 screws for an even more secure mounting. With a sleek ABS plastic construction, the housing is robust, durable, suitable for a variety of uses. If you have any questions about this product by Techbee, contact us by completing and submitting the form below. If you are looking for a specif part number, please include it with your message.